Kimberly Stultz, Pharm.D., a 2009 graduate of the University of Florida College of Pharmacy, is returning to the college to lead the Office of Experiential Programs. Stultz was named director of the program in October 2018. 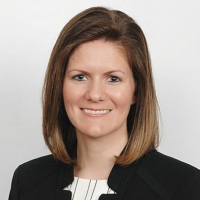 In her new role, Stultz will lead the experiential team in overseeing and coordinating advanced pharmacy practice experiences, or APPEs, and introductory pharmacy practice experiences, or IPPEs. She will provide pharmacy students with orientation to experiential learning, coordinate student schedules and oversee student and site evaluations. In addition, she will facilitate the recruitment and retention of high-quality preceptors and experiential sites and assist in preceptor orientation, training and continued development. Prior to joining UF, Stultz served as an assistant professor and director of experiential education at Lake Erie College of Osteopathic Medicine in Bradenton, Florida. She also worked eight years as an assistant pharmacy manager for Publix. She served as an IPPE and APPE preceptor for three colleges of pharmacy from 2011-16, including the UF College of Pharmacy. She also mentored UF College of Pharmacy students as a career coach and course facilitator at the St. Petersburg campus from 2014-16.